Johanna speaks at the ribbon cutting ceremony for our new headquarters in San Diego. 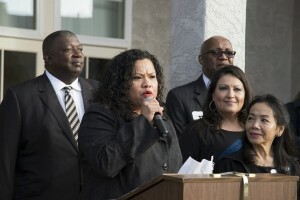 Johanna Puno Hester is the Assistant Executive Director of UDW AFSCME Local 3930 in California and was elected as an AFSCME International Vice President in 2012. She is also the National President of the Asian Pacific American Labor Alliance (APALA), the first and only national organization of Asian Pacific American union members to advance worker, immigrant and civil rights. Johanna began her career with the Healthcare Workers’ Union. When the union moved to organize hospitals, she was recruited to help talk to a growing core of Filipino nurses. This was the very venom that captured her attention to the inner workings of the labor movement. Johanna was later awarded the Minority Leaders Fellowship Program from the Washington Center. The program allowed her to get exposure to several national movements, working primarily with local voter registration efforts in the DC area and raising awareness about civil rights issues nationally. It was a time that witnessed the convergence of a national student movement and civil rights movement of community, labor and student activists from the Philippines and in the United States. This experience ignited her political consciousness and she learned to develop the principles that would guide her work for years to come. Johanna began her career with AFSCME as Lead Organizer in 1999, organizing 2,000 recreation and park assistants in Los Angeles. She worked in several organizing campaigns, including the University of Maryland campaign, New Mexico University Campaign and other state organizing campaigns before she settled with UDW in 2008. Johanna is now championing the homecare cause and is one of the most respected labor leaders in AFSCME and throughout California. Friends, family, workers, and the countless leaders that she has paved the way for can all attest to her passion, dedication, and commitment to growing today’s labor movement for tomorrow’s generation of labor activists.